Bring or rent a boat because you'll also have your own boat slip with fresh water to wash off boat or dive gear. Dive shops within a 1/4 mile. Enjoy fishing right off the docks. View manatees and dolphins that frequently swim by the dock as you watch the spectacular sunset. - The unit is has everything you will need for the perfect vacation. Our family grew up in Florida and were constantly visiting the Keys which is why we purchased a second home there. We bought our home away from home in Key largo because we loved the feel of being so far away from the craziness of everyday. Yet, it is very easy to get there. 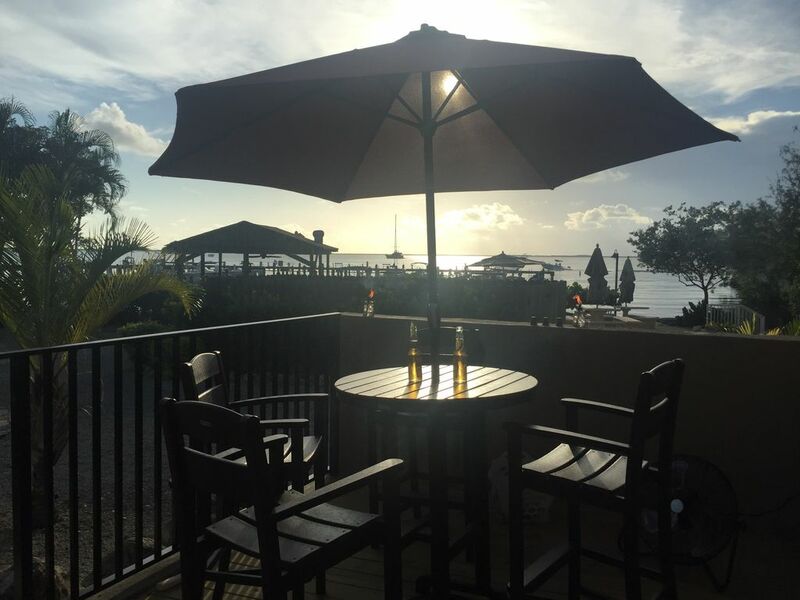 While we are staying at our place in Key Largo we enjoy relaxing, beautiful sunsets at our dock, deep sea and flats fishing, diving, snorkeling and the benefit of being very close to John Pennekamp Coral Reef State Park. There is an additional Kitchenette downstairs. We had a wonderful stay in Rebecca's condo... the lower floor allowed privacy for my adult daughter and her new husband, while still allowing us to be together for family meals etc. The unit was clean, and directions for everything were posted. We had a little problem with garbage disposal, but Guillermo (one of the maintenance men) helped us out. Another worked, Ty, was unbelievably helpful; and the residents of the resort were friendly and welcoming. The beds were comfy, appliances and linens clean, and the view....AMAZING!! We were treated to the Key Largo Christmas Boat Parade on Saturday. Wow!! We had a wonderful trip and look forward to staying at Moon Bay again. Probably the best unit in the complex, great views and mere steps away from the water, pool, sauna, sundeck, and grilling stations. Some of the best sunsets ever from your own balcony. This is basically two separate units with separate entrances which makes it great for extended families. The kitchen is very well stocked with quality utensils and cookware, and some pantry staples (from my experience this is a rarity in a rental). Amazing facilities, dock is very welll kept and has tons of wildlife. Underwater lights at the marina attracts tarpon, shrimp, crabs, and all sorts of fish at night; while during the day we watched nurse sharks, puffer fish, and many other critters. The permanent residents are very friendly and welcoming. Very close to some great places; John Pennecamp Park and some of the best restaurants in Key Largo are within 2 miles of the complex. We can't recommend this enough, and also can't wait to return. The resort was a great location and the condo was very close to the bay. Pool was nice. Was a little disappointed that they didn't communicate that these were 2 different unconnected units and not a three bedroom unit. The person in the bottom unit was very disappointed. Also there was no privacy in the bottom unit due to broken blinds. These were mentioned in earlier reviews so I was surprised they were not replaced. Being the corner unit, every person walking by could see right into the bedroom. They also needed to treat the place for bugs as the sand fleas in the unit were a real nuisance. We were not bothered by bugs at the pool or on the dock.We were also surprised that the owner did not communicate that much of the area was still closed due to hurricane damage. Wait a while before coming. New blinds will be installed within a week or two, the repairs are not working. The condo association performs regular pest control, they will be contacted. Our rental site discloses the floor plan. The upper keys are largely open for business post hurricane. It's good to inquire directly with locations of interest in advance. Please consider us and the Florida Keys again. We enjoyed our stay in your condo everything was neat and clean. It was comfortable for the 7 of us. We would recommend it to anyone. Everything was close and convenient. It was nice to have the marina to keep the boat that close. The pool was close and well kept. I booked this vacation as a Christmas present for my family. We have three adult children that live away from us and thought it was a great way for us to reconnect. This rental was perfect. Rebecca made the arrival flawless and the property is perfectly situated overlooking the water. The pool is just steps away. We visited the Everglades, rented a boat for several days and got to see manatees, dolphins and turtles. The property is beautifully maintained and everyone was very friendly. We will definitely consider renting this condo again. When using the rate calculator, please keep in mind that it isn't taking into account the monthly rate discount. If you are looking for a month, please email me for your total rate. Thanks!